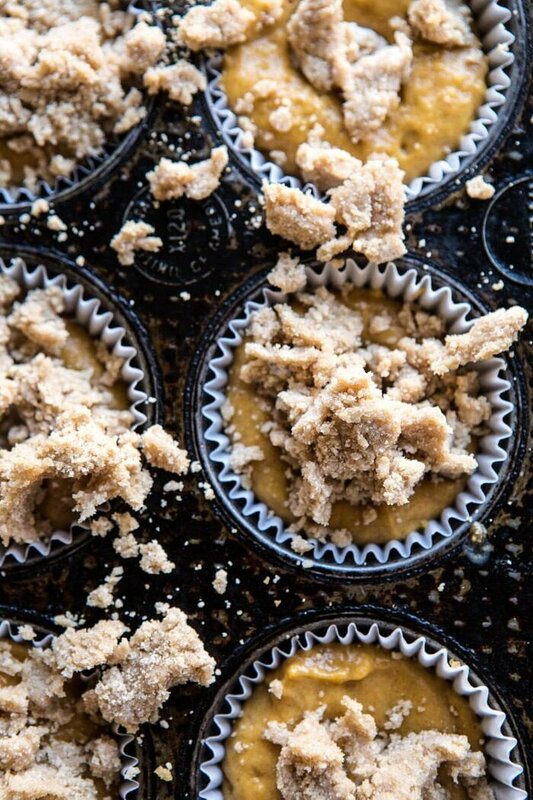 Welcoming in the weekend with these (better than the bakery) Pumpkin Coffee Cake Muffins with Cinnamon Honey Butter. 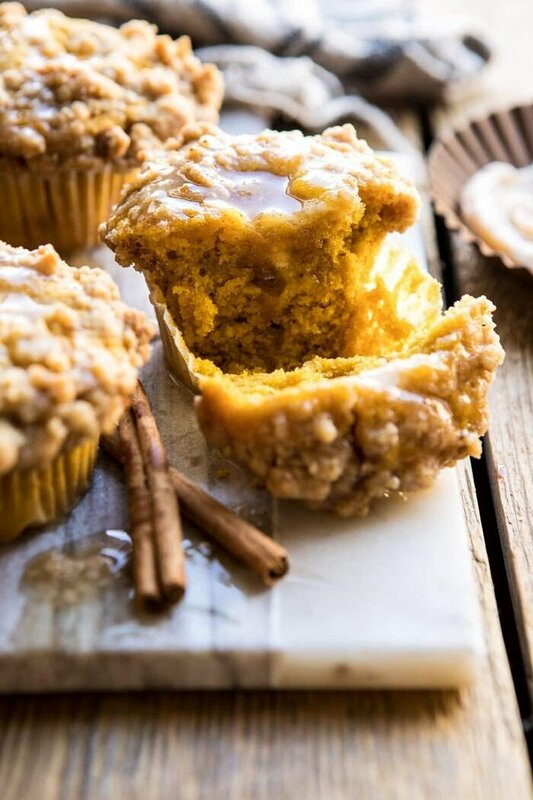 Moist pumpkin muffins stuffed with cream cheese, topped with crumbly streusel, and served warm. Perfect for all of the autumn weekends ahead, and best eaten just out of the oven with a generous smear of cinnamon honey butter. So GOOD! All month long I’ve been focusing on September apple recipes, but with October first just a couple of days away, I cracked and decided to share my first pumpkin recipe of the season. Part of me wanted to wait until it was officially October to share these muffins, but the other part of me just couldn’t wait. In the end, I figured that most of you would probably prefer to have this recipe sooner rather than later, so today we’re talking pumpkin coffee cake muffins (with cinnamon honey butter!!) and I’m pretty excited about it. As if you could not tell. It’s hard to believe, but I’ve never shared a pumpkin muffin with you guys before. Truthfully, I don’t have that many pumpkin recipes on HBH. I mean, there’s enough, but considering how often I share recipes, and especially how much I love autumn recipes, pumpkin doesn’t have nearly the presence here on HBH that it should. Plus, most of the pumpkin recipes I do have are savory ones. This fall that will all be changing. Because I am very much in a pumpkin state of mind, and all I want to do is bake with pumpkin and pumpkin spice. It’s kind of a problem, but it’s a problem I am very much embracing. If you guys have been keeping up with my daily posts recently, then you’ve probably noticed that I’ve been a little more anxious. All is good, but just a lot going on, so my anxiety has been a little worse these last couple of weeks. Whenever my anxiety flares up, I almost always find myself wanting to bake all things cozy. I find baking, especially fall baking, to be so incredibly relaxing. It reminds me of being a kid, and baking cookies with mom on cool fall days back in Ohio. I love it, and this is why you can expect lots of sweets this fall. It’s just the mood I’m in. SO, let me tell you about these here muffins. I tried two variations, loved them both, but in the end, I decided to go with my second version. This version won me over with its stuffed cream cheese. And when topped with cinnamon streusel, and served with cinnamon honey butter…yeah, it was pretty much a no brainer. All you really need to know is that every last bite of this muffin is beyond delicious. Think roll your eyes back good. These are moist, buttery, swirled with cream cheese, crumbly on top, perfectly sweetened, and soo very cinnamony. I couldn’t ask for a more perfect muffin. The batter is made simply, with the standard butter, eggs, and flour. The key here is using real pumpkin puree, and a good amount of it too. I used a full cup for major pumpkin flavor and moisture. For extra flavor and sweetness, I turned to sweet brown sugar, cinnamon, and pumpkin pie spice. 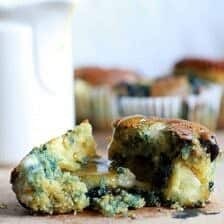 For a creamy element, and to balance out some of the sweetness, I stuffed cream cheese into the middle of each muffin. Not sure if this seems weird or not, but trust me, it’s the best addition to a muffin. First, think of your favorite pumpkin spice bagels smeared with cream cheese. 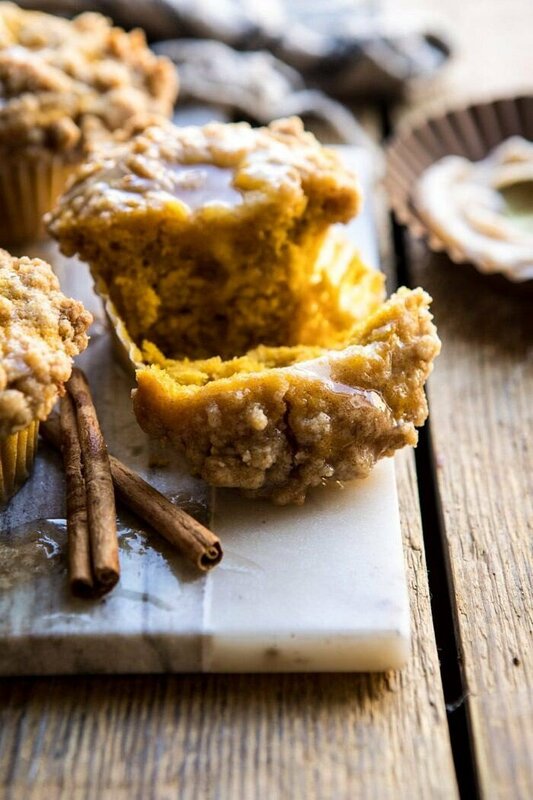 Now think of a moist pumpkin spiced muffin stuffed with cream cheese. YES…and it gets better. 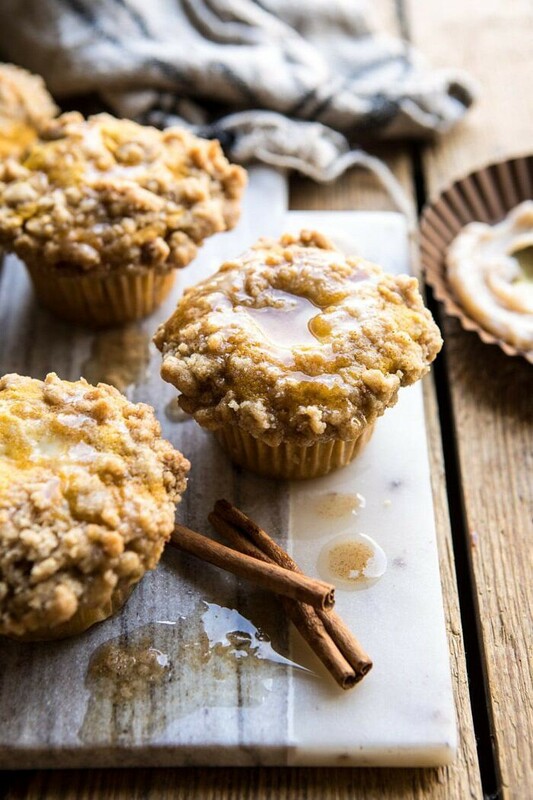 Add streusel to the top of each muffin, then bake, and smell all the deliciousness coming from your oven. These are so good. The smells alone are reason enough to make these muffins. So cozy, so autumn. The muffins themselves are great as it, but you all know me. I of course needed to take things a step further. Enter the cinnamon honey butter. I’d say this is optional, but really, it’s not. You just have to smear this all over your warm muffins. It’s the most indulgent addition, and it’s absolutely what your muffin needs. And it’s what YOU need too. Go with me on this, it’s fall, just go all out it. It’s really the only way. And with that, let’s call it the end the work week, welcome in the weekend, and bake up all the pumpkin coffee cake muffins! Enjoy, and see you tomorrow for our first “Spooky” Cocktail Saturday of the season! If you make these pumpkin coffee cake muffins, please be sure to leave a comment and/or give this recipe a rating! Above all, I love hearing from you guys and always do my best to respond to each and every comment. And of course, if you do make this recipe, don’t forget to also tag me on Instagram! Looking through the photos of recipes you all have made is my favorite! 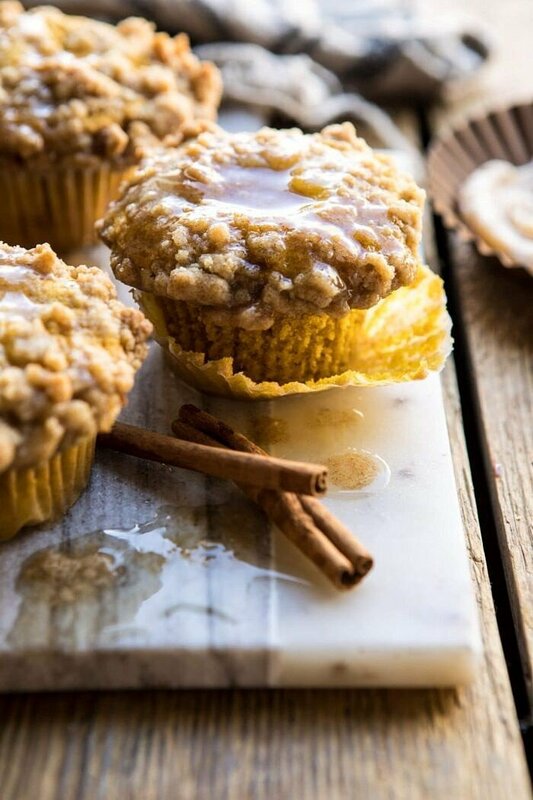 Moist pumpkin muffins stuffed with cream cheese, topped with crumbly streusel, and served warm. Perfect for all of the autumn weekends ahead, and best eaten just out of the oven with a generous smear of cinnamon honey butter. So GOOD! 1. Preheat the oven to 350 degrees F. Line 16 muffin tins with paper liners. 2. In a large bowl, mix together the butter, brown sugar, and vanilla. Add the eggs, one at a time, until fully incorporated. Add the pumpkin and milk, beat until smooth and creamy. Add the flour, baking powder, baking soda, cinnamon, and pumpkin pie spice. Mix on low-speed until just combined, being sure the batter is completely mixed. 3. To make the streusel. In a medium bowl, combine the flour, brown sugar and cinnamon. Add the butter and use your fingers to mix the butter into the flour until a crumble forms. 4. Divide the batter among the prepared pan. Push 1 cube of cream cheese into each muffin. Evenly sprinkle the streusel over the batter. Transfer to the oven bake for 25-30 minutes or until a toothpick inserted into the center comes out clean. 5. Meanwhile, make the cinnamon butter. In a small bowl, combine the butter, honey, and cinnamon. 6. 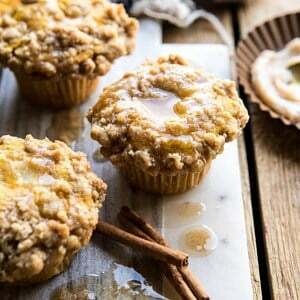 Serve the muffins warm or at room temperature smeared with cinnamon butter. Enjoy! Better Than the Bakery Chocolate Chip Coffee Cake Muffins. 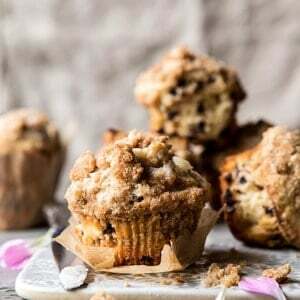 Chocolate Chip Banana Bread French Toast Muffins with Cinnamon Streusel. Can we use candy gems in this recipe ?? Very simple words have been used to explain this method Thanku so very much sharing this great recipe. You had me at the cinnamon honey butter!!! So good!!! Thank you so much Sheenam! Well. . you might not have many pumpkin recipes on the site but this little beauty more than makes up for that. It looks utterly irresistible. And I want to schmear that cinnamon honey butter on everything. Yumm-o!!! I am so glad you like this! Thank you Lynn! Quick question: if we wanted to leave out the cream cheese would the bake time still be the same? I hope you love it! Thank you Brittany! You forgot the cream cheese in your ingredient list. I struggle with anxiety too, and it always helps to do things that remind me of being an innocent kid, when you had no worries and everything was just so perfect and happy all the time, no stresses just happy warm memories! … anyways these look AMAZING! that crumble topping is so perfect effect! That is such a good way to deal with it! Thank you for this, Michele! Also, I am so glad you like this coffee cake! These look delightful! We love dairy in our family but it does NOT love us back 🙁 Will the muffins still be okay without the cream cheese? Any alterations I need to make in regards to baking time? Thank you for making my day! This is exactly what I’ve been wanting! Amazing flavors and moist crumb! On a side note, I made these with whole wheat flour (milled at home, of course) and they worked out beautifully. Also, my favorite pumpkin (or squash) to use for baking is Kabocha squash, it’s so sweet and just bursting with flavor! Love that! And I am so glad this turned out amazing for you Victoria! Thank you! YUMM! Baking calms my anxiety as well! It’s so comforting, especially when streusel and fall spices are involved. I can’t think of a better way to start or end the day then one of these muffins with a big mug of coffee or chai! Bring on all the pumpkin these next couple months!!! I made them this morning! Delicious! I’m a chocoholic so I added some chocolate chips to a few of the muffins… yummy addition! Thank you for the recipe! We just made these and for me, this may be the best muffin I’ve ever had. 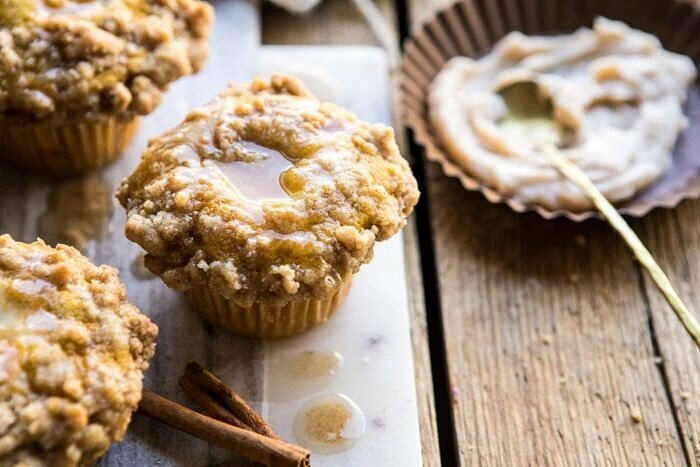 I LOVE coffee cake muffins and I LOVE pumpkin, so to combine the best of both worlds is just awesome! They are so moist and flavorful! We opted to bypass the honey butter and went with a more traditional drizzle of a confectioners sugar glaze. Thank you for this great recipe and for all your great work! What do you mean by “real” pumpkin purée? What should I be looking for? Let me tell you that I’ve been following you for years… And when I saw your recipe in my email I knew why I follow you..
Can’t wait to make these! How long will they keep for and how are they best stored? Just made these tonight. Omitted the cream cheese. Did not diminish there goodness all. Excellent bake! Thanks! I am so glad you loved this Steven! Thank you! 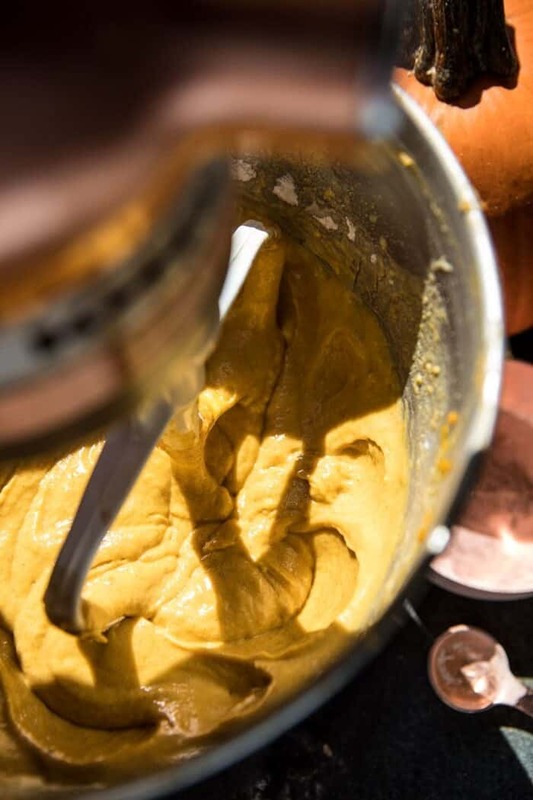 You mention in this one , the key is using pumpkin puree , but i would love to know how to make it :@ since i am from Mexico, and it is not so common over here! Hi Tanina! You can either use store bought pumpkin puree or use a homemade recipe! I will provide a simple one below! Bake in the preheated oven, foil side up, 1 hour, or until tender. Scrape pumpkin meat from shell halves and puree in a blender. Strain to remove any remaining stringy pieces. Thank you Shikha! I love cooking to help me, and I am glad you are finding cooking to help you as well! This look great, I love all the fall recipes. I’m going to make these and your double the streusel apple butter bars for some friends and family this weekend. 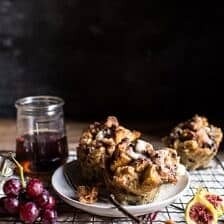 Question about these muffins, and actually about any muffin recipes: can I make this as a bread instead, like in a 5×9? I also think I’ll use half white whole wheat flour – think that would work? Thank you! Oh my, these are good! Made them this past weekend for breakfast. They bake beautifully at the altitude we live at!! AND, they need to be served with the cinnamon honey butter. Thanks for this recipe! Thank you Kim! I am so glad these turned out amazing for you! 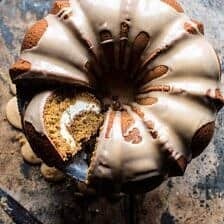 This might be a stupid question, but what makes it a coffee cake, if there is no coffee in it? Regardless I am excited to try this recipe! I made the muffins tonight! They are absolutely delicious and super easy to make. Thank you for a recipe that our entire family enjoyed eating. I am so happy to hear that Nate! Thank you! I can’t wait to surprise my daughter with these tonight. One question: Is the butter for the muffin batter chilled or at room temperature? I know it’s chilled for the streusel topping but wasn’t sure initially. Hi Robin! Yes, it is! I hope you love this recipe! These were delicious and I would definitely make them again, but I added a half teaspoon of salt and they definitely needed it, in my opinion. Thanks for a great fall recipe! I am so glad you loved this recipe, Sarah! Thank you! This muffins are wonderful! They remind me of bakery muffins but better! I made 12 larger muffins instead of 16 and they cooked perfectly in 30 minutes. The little cream cheese at the top mixing with the streusel is wonderful. My tried and true pumpkin muffin recipe has been failing me of late and yours came just in time. Thank you for sharing this! I will definitely be making these again soon! That is so sweet! I am so glad these turned out amazing for you Marie! Thank you so much! I would suggest removing the cream cheese from the list of streusel ingredients…for fear someone distracted like me adds it to the streusel. Was still delicious. I thought these were particularly delicious warm even without the butter. Did add a bit more to all the spices as I always find I can never have enough spice w pumpkin, or maybe my spices aren’t as fresh as they should be?? I am so glad you enjoyed this Tanya! Wow! Made these muffins last night and only used about 9 tablespoons of butter in the batter since thats all I had and they were still so moist. Thank you for sharing another great Fall recipe. Thank you so much! I am so glad you loved this Charmaine! These are delicious! I just ate the last one this morning and I am pulling out the ingredients to make them again!! The honey cinnamon butter puts them over the top. I didn’t have any cream cheese so I substituted marscapone which I think was a little too soft so I’ll use cream cheese this time. Thank you for another incredible recipe!! Thank you so much Beth! I am so glad you liked this! These are in the oven as we speak. I noticed the batter was way thicker then the pictures so I added more milk. Not sure if I totally screwed these up but crossing my fingers! Let me know how they turn out Sandy! Thank you! Loving all your recipes – so much that we’re making a course meal while hosting friends with all your recipes! Random and maybe silly question… but, can I make this batter and refrigerate overnight to just save prep time day of hosting? I don’t want to compromise the recipe! I made these this morning and oh my! They are so so good! 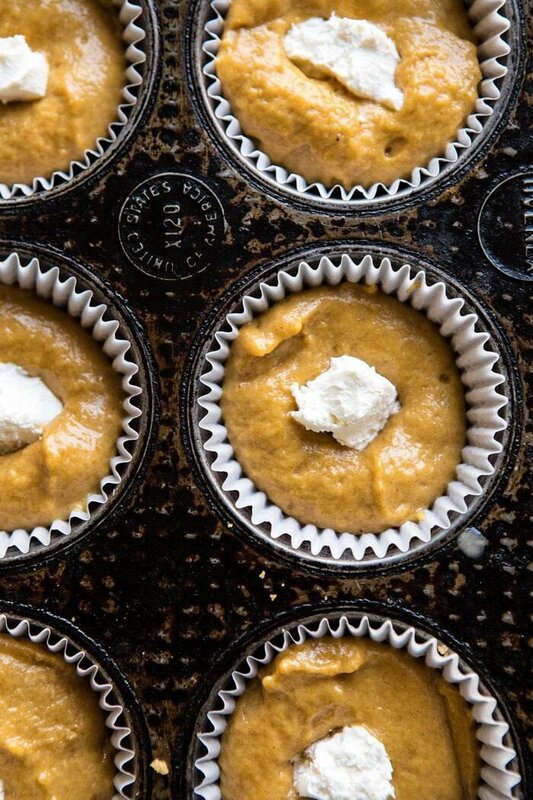 This is the perfect pumpkin muffin recipe. And the honey cinnamon butter was over the top on them. Thanks so much for the recipe. Thank you Tina! I am so glad you like this! Is it possible that these muffins can taste better than they look? They do! OMG then the honey cinnamon butter…I have shared the muffins with my girlfriends because I would have eaten them all! Thank you so much Joann! I am so glad you loved this! These were hands down the best muffins I’ve ever made. I skipped the cream cheese (instead served them with cinnamon cream cheese) and YUM! Thank you so much! I am so glad you loved these Libby! Just made these…. they are AMAZING!! Love love love this recipe! Quick question! I know you said you made two versions, one with and one without cream cheese… are the ones you pictured without cream cheese? I wasn’t sure if I missed a step in the recipe, because mine had a very visible little blob of cream cheese in the middle once done. They were still totally delicious, I was just curious! Thank you for this amazing recipe!!!! These disappeared fast. Perfect texture. Yum. What do you think about substituting Greek yogurt for the cream cheese?? Thoughts? Also I LOVE all of your recipes. Everything of yours that I have made is absolutely delicious. Thanks for sharing!! Hey! Any advice on how to store these awesome muffins? Do these freeze well? I’d love to double the recipe and keep some for later! Hey Trinity, can you give me some info on how you baked these muffins. I have not had other readers have any issues with these muffins, so I am not sure what happened. Did you change anything about the recipe? any details you can give me will help me to understand what might have happened. Made as a coffee cake and not muffins. Came out beautiful! Delicious! Obsessed with this butter. Used honey I bought from Greece. My husband and I couldn’t stop eating this bread! Thank you so much Chrissy! I have been looking at the recipe and drooling for a month. I finally roasted and puréed the pumpkin yesterday and made the muffins today. Yuuuummmmm! For whatever reason I don’t always try what I bake so I use my family as test subjects. As soon as they were out of the oven I gathered some up along with the butter and raced them up to my mom. She made a cup of tea and proceeded to demolish a muffin. She loved them. So after her rave reviews I had one when I got back. They are a perfect blend of flavor in every bite! One of my dogs, Shadow, is an excellent counter surfer and snatched one for himself and he agrees! Thank you! I am so glad your family loved these muffins, Hollie! Thank you so much! I’ve been meaning to make these since you posted them on instagram and finally got around to it! I didn’t have milk so I used buttermilk and subbed 1/4 tsp of baking soda for 1/2 tsp of baking powder (so 3/4 tsp baking soda and 1.5tsp baking powder total) to help with the extra acidity of the buttermilk. And I used white whole wheat flour to pretend that I’m making it healthier, haha. These were so so so good. Like, fall party in my mouth. I’m already planning to make some for work soon! I’m super excited to try more of your recipes! Maybe next time I’ll make sure that I actually have all the ingredients before I start cooking, haha. Thank you so much Natalya! I am so glad you loved this recipe! I love all your recipes I’ve made so far thank you!! I want to make these for someone who doesn’t eat white flour any suggestions?? How do you think the recipe would be with using Coconut Flour?? Hello! What size tins did you use? Are we talking large like Costco sized muffins, or smaller/more standard “cupcake” size? I made these pumpkin muffins vegan style !! They were absolutely delicious 😍. Thank you for sharing this recipe !! I am so glad you loved these Lisa! Thank you! I made these with canned pumpkin and the batter was too thick, so the cream cheese didn’t melt much and the crumble just fell off the muffin. Was this because of the pumpkin I used, or did I screw something else up? I actually added extra milk to my batter because it was so thick at first. Taste was INCREDIBLE but presentation not so much lol. Hey Jenaya! What brand pumpkin did you use? Did you change anything else about the recipe? Any more info you can give me would be helpful in problem solving. These are perfect! I’ve made them 3 times this month. Honestly, nothing to tweak- it’s a great recipe. Everyone loves them.